The elterwater panels are situated outside the main entrance to the Lorimer Chapel.The panels are made of Westmoreland green slate. Unfortunately, because of the location there are restrictions on items which can be placed at the foot of the wall. The lease of the panel is for 10 years. You may renew this at the end of the period. There is room on the panel for up to five lines of inscription. 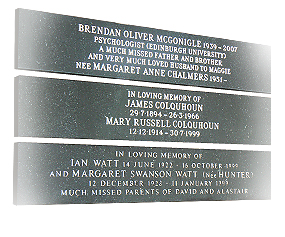 It is also possible to leave space for an inscription to be added in the future. The inscription is in white lettering.